Caretaker manager Gary Teale was aggrieved at the officiating in his St Mirren team's in Paisley. Referee Steven McLean sent off Buddies forward Yoann Arquin for a second bookable offence after the striker took a tumble in the penalty box. There were still 10 minutes to play at that point but St Mirren were trailing, despite Kenny McLean having given them a 1-0 half-time lead. In controversial circumstances, Dundee levelled through Gary Irvine eight minutes after the interval and Iain Davidson put the Dark Blues in front. 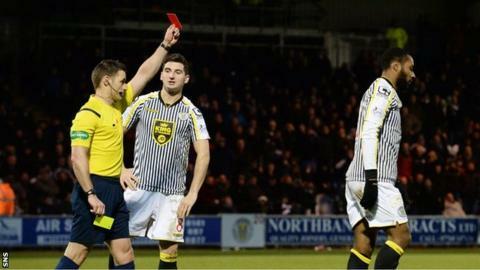 Arquin was sent off last week at former club Ross County, though that was later reduced to a yellow card on appeal. His first booking against Dundee was for a foul on Davidson. "It's a big call for the referee to make," Teale told BBC Scotland when asked about his player's dismissal. "I thought both bookings were very, very soft. Was that maybe because we had the red card rescinded from last week? It's a very cynical way of looking at things. "The referee said it was for simulation, trying to cheat him in terms of giving a penalty. "James McPake stood on his foot but the referee feels as if he took a step and then went down. "It's a difficult one for me to take. These decisions are proving very costly." And Teale, whose team are still searching for their first home league win of the season, was angry about Dundee's equaliser. He said: "I think Greg Stewart wriggles free, plays the ball and Gary Irvine is beyond our back line and then puts the ball in the back of the net. "I'm struggling to interpret what the rules are. The linesman is looking along the line. If he can't get that decision right I'm not sure he should be there. "I've looked at the pictures again and he's offside. It beggars belief. It's a straightforward call. I'm struggling for words in terms of what I can say. "But I don't want to disguise that it's another home game without a victory. It has not been good enough for us again. We need to go back to the drawing board and get this right. "We need to make sure we are sticking together and start coming up with answers." Teale spoke to referee McLean after the match and said the official stood by his decisions. Some better news for Teale on Saturday was that talented midfielder Stephen Mallan has signed a three-year contract extension which ties him to the club until 2018. Dundee manager Paul Hartley was delighted that his team had recovered from falling behind. He said: "It wasn't our best performance - our goalkeeper kept us in it - but I thought we showed great desire and commitment and resolve today. "I think it is the first time we have come back all season after going a goal down. I'm delighted with the three points. It's been a tough period for us but I'm delighted with the response. "We are on a good run just now. A lot of people would have tipped us for the drop at the start of the season but I know the group of players that we've got. "It's been great but hopefully we can get better and better. We want to finish as high as possible and win as many football games as we can."